The legendary Maya Angelou has passed away at the age of 86. 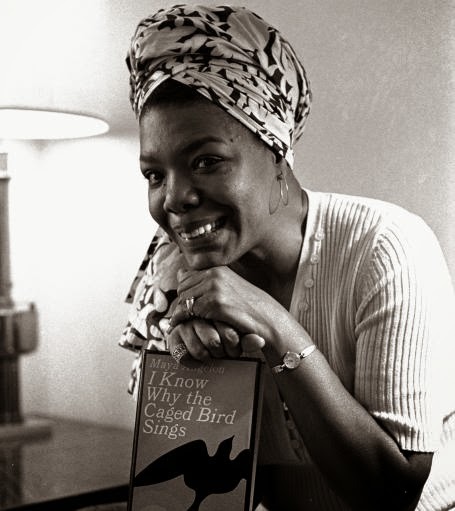 A gift to the written word, Angelou is best remembered for her acute philosophies and unflinching autobiographies, including the literary masterpiece that is 1969's I Know Why The Caged Bird Sings. Angelou's life was peaks and valleys, and really all you have to do is pick up her books, read her poems, and listen to her speeches to understand the travels and trials this woman has experienced, and how she healed through allowing her voice to tremble and quake like the earth. Maya Angelou is someone who made me love words, the ebb and flow of them, the organization of them, the magic of them. She is one of the few authors who could tell of harsh realities, but say it with a tender hand. Poetic crystal clear honesty is how she did it, and she sliced the air with her prose, churning out seven autobiographies and numerous collections of poems and essays for over 50 years. My first experiences with Angelou's words were in high school, when I read and learned to recite two of Angelou's most well-known poems, "And Still I Rise" and "Phenomenal Woman" for the theater class I was in. Those words never left me, and continue to bring me comfort whenever I recall snatches of lines, especially "Phenomenal Woman", which overflows with feminine pride that it's sweet symphony. At the time I didn't know I was supposed to be aware of my femininity on that kind of level, it took me aback really these bold words of "look at me! I am W-O-M-A-N! ", and I felt sort of juvenile when I did read it aloud for the first time because honestly, that was a lot of femme pride to handle as an awkward and braced-faced teen who wasn't keen on the body given to me because it was doing some wacky stuff, nor was I aware of my 'inner mystery' or the 'grace of my style'. Yet like most great works you can grow with them, and well, homegirl was right all along. Angelou had that gift of cultivation --- she plants the seed, time sprinkles down as water, and then you, the reader are the bud and you grow on from there. For a lot of Black girls like myself, Angelou spoke of all of our gleaming dimensions candidly, informing us in clear code that we owed ourselves the right to roar and be fearless, but that we also shouldn't be ashamed shed a tear and show vulnerability. Reading her prose, hearing her thought processes was as if we were talking to a mother, grandmother, aunt, friend that went on the same trip, only that she took that trip the week before and was telling us all about her findings. To hear someone smash stereotypes and be so bold like that was important to me as a young girl wrestling in my adolescent and trying to find my place as a young outlier. While rattling off the page, the supreme power of Angelou's words aren't truly felt unless you hear them in live time, and I had the privilege to hear Angelou speak when I was a sophomore at University of North Texas. It's one of the more warmer memories of my time there, and I admit I don't remember everything that she said that night, because I was in awe, dumbstruck to the fact (and let me get creepy for a second) that I breathing the same air as her. But I collected myself mid-way into her speech and settled into that steady honeyed voice (seriously, that woman's voice is a damn lullaby) and became further inspired to pursue my writing aspirations so I could pave my own road with my own unique voice, as did she. As much as I struggle with self-doubt while I write, I should, and need to remember that Angelou went the extra mile to bring sincerity to the craft of storytelling, and that she didn't hesitate to tell another tale, and another one, and another... We should all be fortunate that we were able to bask and connect with her infallible virtue and will be able to continue to do so as her voice, her spirit will continue to live on the page and in the heart. She was a phenomenal woman in every sense of the word.